As a particularly deep February comes to a close, we can look ahead to March with excitement and anticipation.. Winter isn’t over yet. As we progress through the work week, Utah will be impacted by several systems beginning Wednesday and lasting into the weekend. As Pete mentioned yesterday, an upper-level trough will impact northern Utah on Thursday into Friday, closely followed by a system that will bring the largest snow accumulations to central and southern Utah. 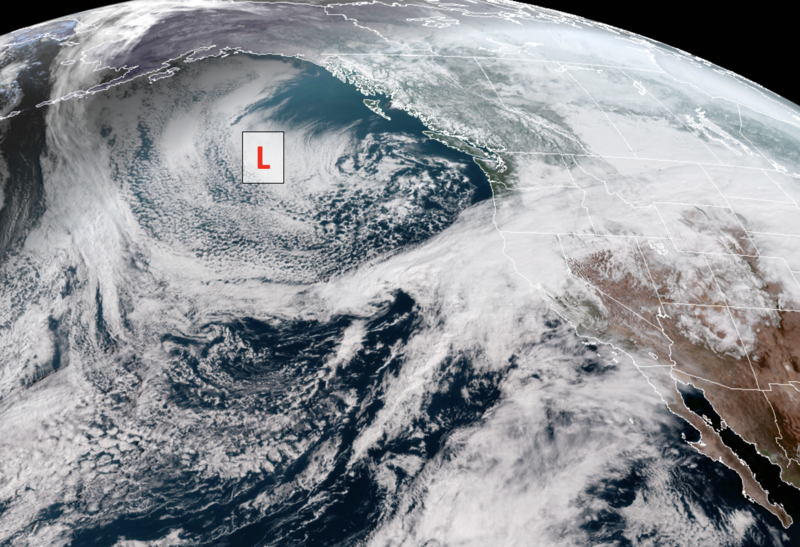 An upper-level low is currently sitting off the Pacific Northwest Coast, as shown by the GOES-West imagery, provided by the CSU CIRA site. 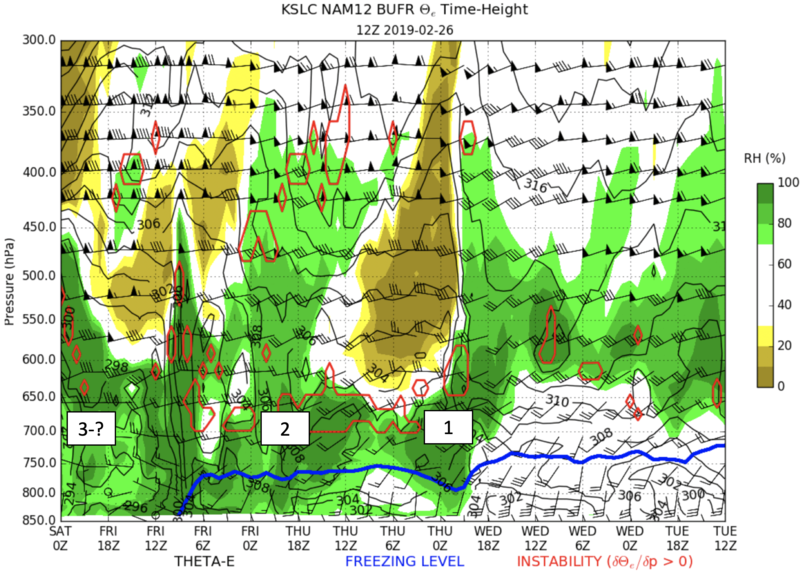 This low pressure system has ample moisture available, which could bring late-week powder to the Northern Wasatch. As this upper-level low moves west, it will eject across Utah and create several smaller short-wave disturbances. Beginning tomorrow and lasting through the work week, snow chances will be on the rise throughout Northern Utah. Prior to the arrival of the main trough on Thursday evening, a stream of moisture will interact with the front side of the disturbance, allowing for some snow accumulations to potentially occur on Wednesday (Labeled 1 on figure below). This will be before the cold front arrives, so snow levels will remain elevated. The trough that is currently located over the PNW will finally move into the area on Thursday, bringing along with it plenty of moisture and lift that will be required for significant snowfall (labeled 2 on plot). 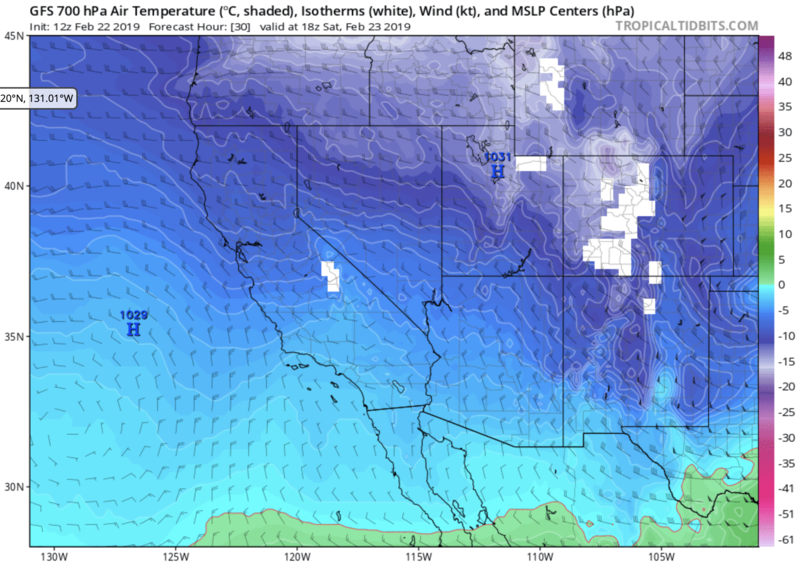 The cold frontal passage wont actually occur until the early morning hours on Friday where the black lines on the plot become vertical and the freezing line (thick blue line) trends toward the bottom of the plot, which signifies the valley floor. Snowfall should continue through Friday. 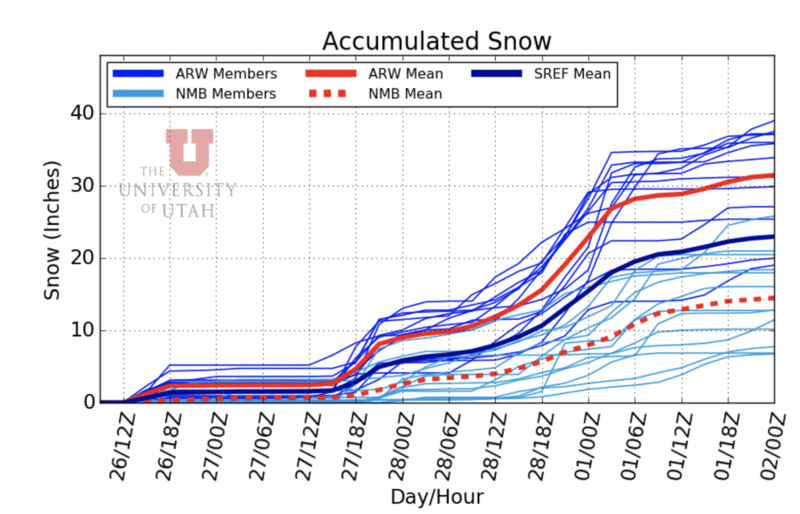 After Friday, some uncertainty arises given the timing and amount of additional snowfall that northern Utah will receive. Some short wave activity and additional enhancement from orographic lift could provide prolonged periods of snowfall, especially when the wind shifts to the northwest. Another source of snowfall could be the low that is set to impact central and southern Utah. Depending on its track, northern Utah could sneak a few extra inches in before its all said and done. So how much snow are we looking at? Ensemble solutions are still varied with some members showing a few inches, and others going bananas with up to 40″ through the end of the week. 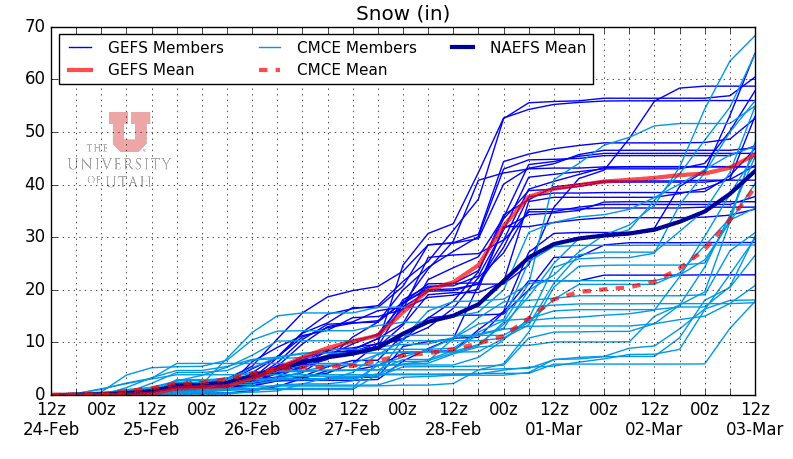 Below is an accumulated snow graphic from the SREF Ensemble for Alta. The model experiences significant bifurcation between its two dynamical cores, but I wanted to post it to show timing of the various systems. Additionally, I think the ensemble mean (dark blue line) is actually somewhat useful as it is close to solutions from other modeling systems. As I mentioned, this is a complex set-up, so the forecast will likely change between now and Friday. Check back with us for the latest. TLDR: Mild and breezy conditions will continue through Wednesday with some snow shower activity producing modest amounts of snow in the mountains, especially north of SLC. By Thursday, though, an incoming cold front looks like it could produce a good amount of snow in the Utah mountains, with another system right behind it for central Utah (Brian Head area). Today has been pretty nice up in the mountains with relatively warm conditions and a fair amount of sunshine in response to a low pressure system to our northwest aiding in the slight amplification of a short wave ridge over Utah. In the below chart you can see temperatures soaring to near 40 degrees Fahrenheit at the Solitude base this afternoon! It has been a bit breezy as well; some mountain locations have received sustained winds averaging in the 15-20 mph range out of the southwest, with gusts up to 30+ mph at times. Winds should remain a bit on the breezy side through Tuesday as we lie just to the south of the polar jet stream. In the meantime, a weak short wave trough looks like it will pass through the far northern portion of Utah this evening, giving the region some increased cloud cover and some light snow with decent accumulations for Beaver Mountain in the 3-6″ range. Powder Mountain may also see up to a few inches, but otherwise all other ski locations should expect not much more than a dusting to an inch. On Tuesday, conditions should remain pretty quiet through most northern Utah ski locations with a chance for some off-and-on passing snow showers and little to no accumulation. The only exception to this is, again, Beaver Mountain, which can expect an additional 2-5″ of snow during the day tomorrow as that trough exits that region. Snow should be ending by around 2PM there tomorrow. Wednesday looks to be pretty quiet in the early morning hours. However, by late morning, we can expect a weakening and “filling” short wave trough making its way in from northern California to brush by with an increased chance for snow above ~5,500 ft in northern Utah ski locations. A general 1-3″ can be expected during the day on Wednesday before that dying trough exits our area early in the evening. On Thursday, the early morning hours should be quiet again with a chance for a light mountain snow shower or two. However, a fast moving cold front associated with an approaching upper level low pressure system out of the Pacific NW will impact northern and central Utah. Exact timing of this system is still a little bit unclear, but as of now I would expect snow shower activity to increase in the late morning hours through northern Utah mountains. In the early evening (after day skiing is over), the cold front should begin making its way through northern Utah, and into central Utah by the late evening. 700 hPa temperatures accompanying this front will be plenty cold, so all mountain elevations should receive snow. Snow should be heaviest while the baroclinic zone (area where cold/dense air separates and is pushing away warmer/less dense air) is moving through in the early to mid evening. During and just after frontal passage, valley floors should get snow too! By early Friday morning, that system should be about done. It’s too early to say how much we’ll get out of this system, but as of now it looks pretty good! 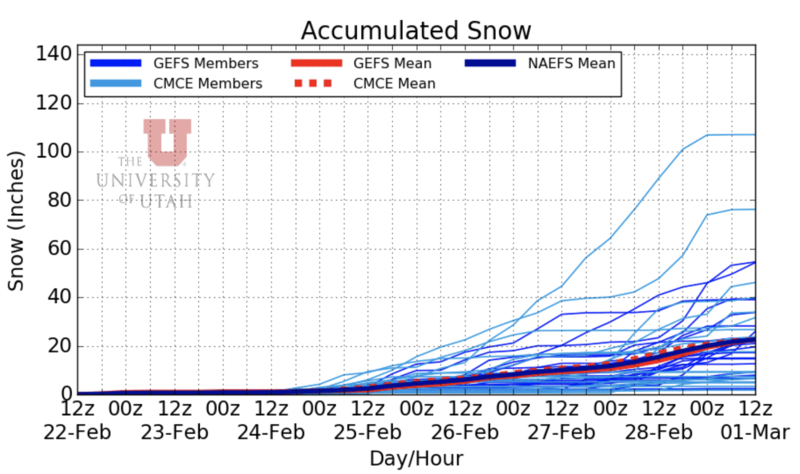 Things don’t look terribly exciting for the foreseeable future after Thursday/Friday for northern Utah, but Brian Head could see a decent storm this weekend. Overall, Utah will be in a relatively zonal/slightly “trough-like” pattern with a chance for another storm midway through next week. That is a LONG way off in the forecasting world, though, so we’ll just have to enjoy the upcoming system this week! For now, enjoy the warm-ish temperatures, and stay tuned for more updates on forecast storm totals for this week’s event! Yesterday’s post by Marcel was a thorough overview of what we can expect this week. While moderate winds picked up this afternoon, today was generally mild and mostly sunny across much of northern Utah. Some decent snow amounts are expected for far northern Utah mountains overnight followed by unsettled weather midweek and potential for a larger storm late in the week. Current mid-level water vapor imagery from GOES-17 shows the current setup with moisture streaming from the Pacific into California and Oregon and infiltrating into the Northern Rockies. Most of the moisture is north of Utah at this time, but some moisture over Nevada will sneak in overnight through Monday morning and produce some snow mainly in far northern Utah. 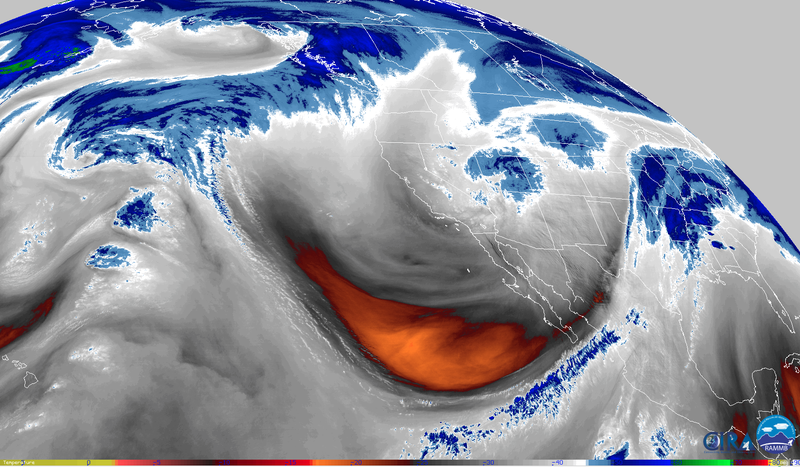 Mid-level water vapor imagery from GOES-West showing moisture infiltrating into California, Oregon, Idaho, and the northern Rockies. Courtesy of NOAA GOES Image Viewer (click to follow link). Expect snowfall amounts of trace to 2″ for valley locations north of Salt Lake County, with generally 2-5″ for the northern Wasatch. Some mountain locations near the Utah/Idaho border could see locally higher amounts of 4 – 8″ through Monday morning. Snow showers are possible over the next several days, mainly over the mountains. 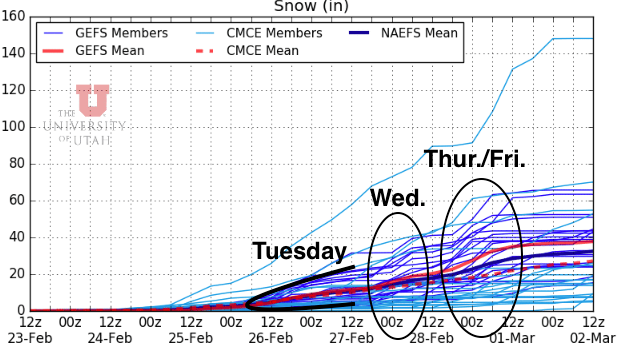 For the late week storm, models are not sure what to expect yet as a large range of snow totals still exist. Check back over the next few days for updates on storms later in the week. To summarize, Sunday-Tuesday sees a gradual shift from stable to unstable weather. Then, a storm Wednesday and another around Friday drop substantial snow over the interior West. Compared to the previous week, we’re under somewhat zonal flow during the weekend. Zonal flow means air in the jet stream moves along latitude lines or east-west. The difference between zonal and north-south flow is that zonal flow tends to propagate systems more quickly. However, these systems tend to have less “spin” to them. 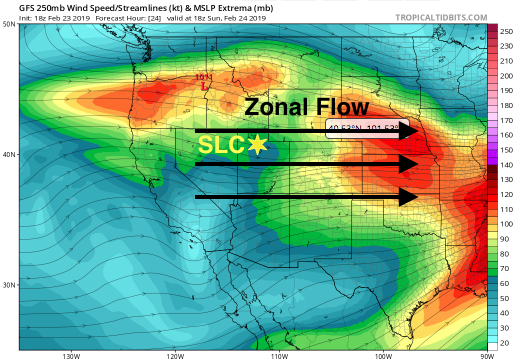 Nevertheless, zonal flow doesn’t necessarily mean fewer storms. 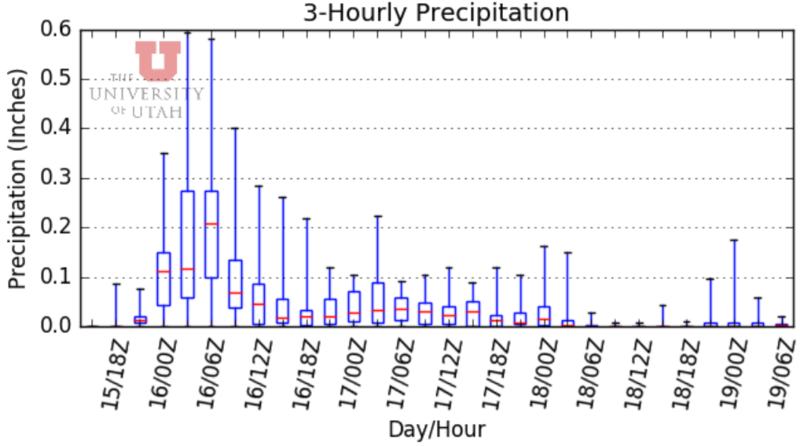 In fact, I think the next few days are looking like intermittent low-impact storm systems before a few harder-hitting late-week storms hit the area. Sunday through Tuesday sees gradually decreasing low-level stability and increasing mid-level moisture. At the same time, an upper-level trough moves in slowly until it’s blocked outside of the jet stream just off-shore of Washington state. It seems like this setup works well for pivoting shortwaves around the upper-level trough and into the interior west. Our area’s mountains may get some weak precipitation from passing unstable air between now and Wednesday. The chance of experiencing these weak systems increases every day as moisture infiltrates the mid-levels. However, their timing is not easily predictable at this point. Otherwise, we’re looking at two stronger storms that arrive here next week. The first hits sometime Wednesday. 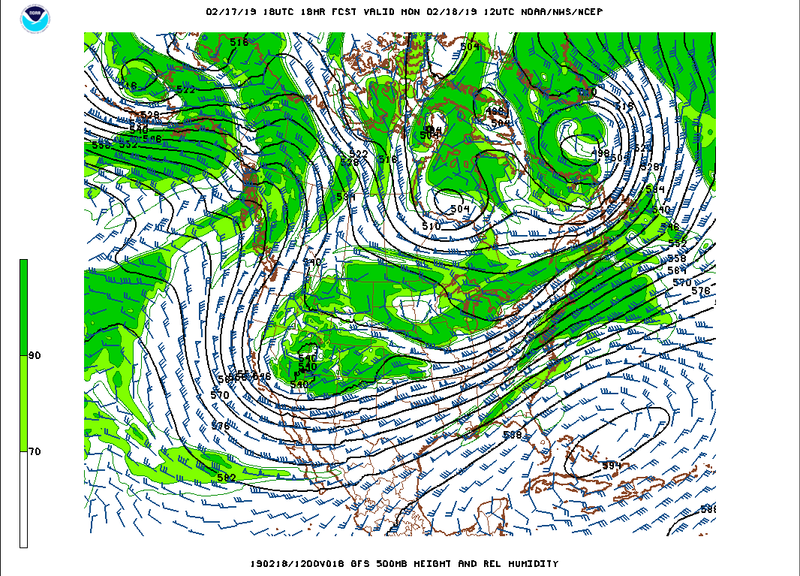 It is a shortwave that loops around the blocked upper-level trough I mentioned earlier. Another system sometime Friday may be stronger. This system is a product of the strengthened upper-level trough itself, as it’s finally pulled into the jet stream and propagated across the US. Ultimately, the impact of each of these systems will depend on their available moisture and instability. As far as precipitation goes, I’m staying away from the late-week systems. Look out for that forecast later this week. Otherwise, NAEFS ensembles are confident that Sunday will be clear of new snow, but Monday and Tuesday each have a chance for 1-3 inches of snowfall per day. The confidence in the occurrence of this somewhat random precipitation increases closer to Wednesday. On the other hand, snowfall totals are still quite uncertain. Next, expect winds to increase over the next few days gradually. Short-term I don’t think this means anything more than a bit of a breeze for resort skiers, Monday and Tuesday for example, even at the summits. Wednesday-Friday, however, may be pretty windy. Just a heads up. Finally, we can expect that temperatures this week will decrease somewhere between 7 and 9 degrees C (or 12-16 degrees F) for every kilometer above the surface because low-levels are conditionally unstable. You might think resort temperatures would then be frigid. However, early-week daytime temperatures in the valley will be increasingly mild (the 40s and 50s), so resort temperatures may be somewhat average in the 20s and 30s. That’s all for now. Enjoy the unsettled weather if you can early this week! TLDR: Southern Utah benefitted big time from a low pressure system and lots of moisture yesterday. Central Wasatch resorts got just enough to refresh the surface of the snow pack. A quiet weekend is on tap for the intermountain west, with our next chance of snow set for early in the work week. As the low tracked northward in the overnight hours, even some Cottonwood resorts got a few inches of fresh snow thanks to the southwest flow and leftover moisture. Accumulated Snow Water Equivalent for years 2014-2019 and 33-year mean. The weather should remain relatively quiet through Sunday with a ridge settling in over Northern Utah. Light wind and little mixing will result in temperatures remaining below normal at all elevations. Air quality is not expected to be a concern during this period. Below is a plot of forecasted 700 mb temperatures just before noon on Saturday. Crest-level conditions will be frigid (~-15 Celsius), so plan accordingly. As Alex mentioned yesterday, uncertainty with the track of the low remains high. This is what is causing the large spread in the ensemble forecast solutions of accumulated precipitation. Here are some scenarios: 1) If the low pressure center shifts further north, our forecasted snow totals will likely diminish to next to none. 2) If the low pressure center shifts southward, our precipitation chances increase and forecasts of accumulating snow will trend towards solutions with higher totals. As the event nears, the models are getting a better grasp on the atmosphere and the ensembles are in slightly better agreement than they were yesterday. Recall Alex’s post with nearly a 100″ spread in total snowfall. Here is the 12Z forecast from the NAEFS, which still has a large spread, but if we ignore the outliers, we are looking at anywhere from 5-40″ through next Wednesday. As always, this forecast is likely to change and will become more accurate as we progress through the weekend. Check back with us every day for the latest information. For now, the snow is great, so enjoy your weekend! This period of cold wind and showery weather is about to end. The trough that has been afflicting the western US is about to get booted out of its spot and sent into the eastern US as a major storm. The immediate impact of this is that temperatures in the valleys will start to warm up. The mountains will be slower to warm, but they should get into the 20s by Sunday and maybe even 30s on Monday. The western trough as seen by GOES-West. Image via CIRA. The last hurrah of this storm system will be tomorrow morning as an area of showers rotates into the Salt Lake region. This will be the remnants of that big winter storm down in southern Utah, but we won’t get nearly as much out of at as they will. Right now it looks like 2-5″ in the Cottonwoods dropping off to less than an inch in the valleys. 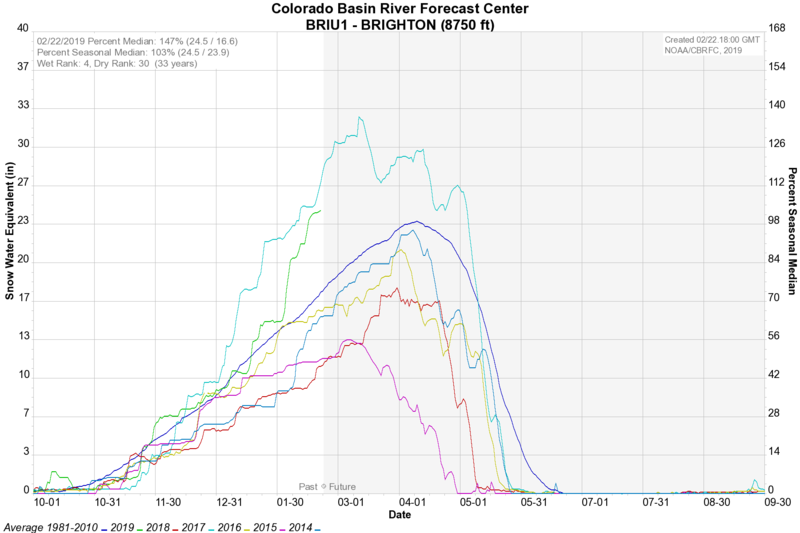 Northern resorts like Powder Mountain will be lucky if they get anything measurable. The possible storm for the start of the week that I mentioned in my post Sunday won’t make it this far south, so we’re going to have a few days of seasonable weather (average in the valleys this time of year is around 45°F as a high). By Monday it should be cloudy. I am a bit hesitant to say much about the weather beyond Monday. We know it won’t be bitterly cold like it is now, and it should be cloudy. But take a look at this ensemble plume chart. 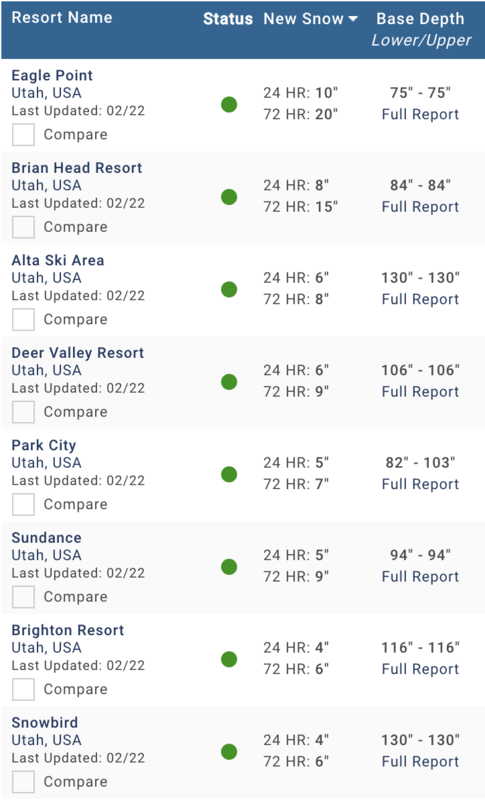 Yes, that has a range of 5 to 115 inches of snow at Alta. Even if we ignore the outlier Canadian members, it’s still a range of 5 to 70 inches, which is enormous. This communicates to me that there is a lot of uncertainty for the last half of next week. I would favor a drier solution right now, but future model runs could go with something wetter once we get closer. It is certainly something to watch. TLDR: Off/On light northern UT mountain snow showers through Fri. Expect 3-6” per day. Another possible northern UT storm Sun-Mon. Southern UT will get a significant storm with 18-30” for Brian Head/Eagle Point from Wed morning – Fri morning and 14-20” for the La Sal area Wed night-Fri morning. 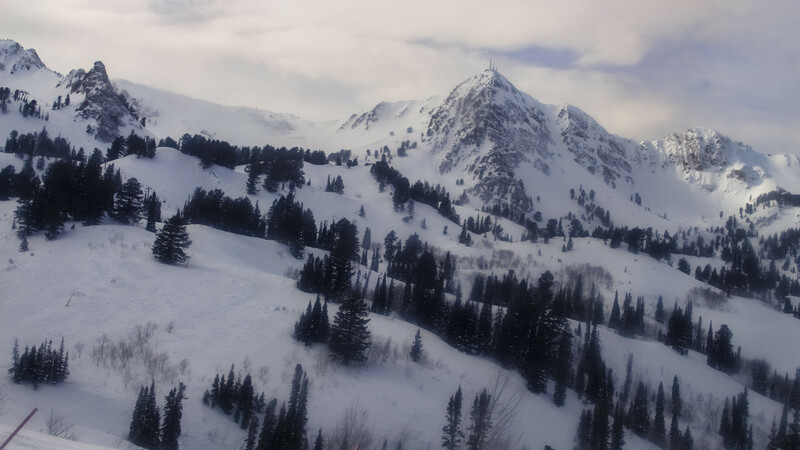 Skiing conditions in the Wasatch are amazing right now with cold temperatures, clouds keeping the sun from impacting the recent snowfall, and a few passing mountain snow showers to give a refresh. Any caveats? 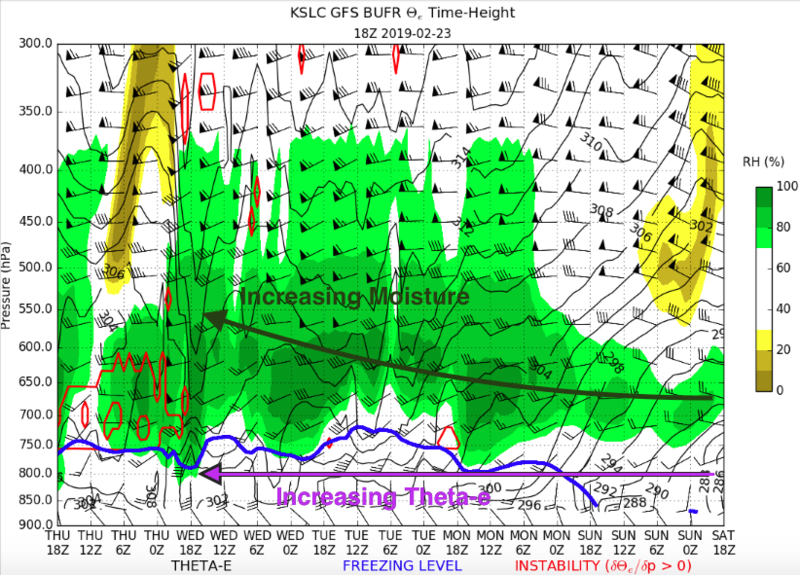 You want to be above last Thu’s rain crust, or roughly 7.5K to 8.0K feet. Anonymous sources confirmed the above report in the Davis County backcountry today…or did they since they also reported not seeing another soul and did not take any photos? The aforementioned “few passing snow showers” are the result of relatively moist northwest flow amid passing short wave troughs. Some of these appear to be enhanced by the Great Salt Lake as they pass overhead (see below image and note precipitation upstream of the lake but stronger precipitation over and downstream). It was showers like these that dropped ~2” at Alta from 3-4pm today and ~1-2” at Snowbasin from 10-11am. In both cases that appears to match the amount that fell during the remainder of the day. Rest of the Week: Northern Utah can expect these showers to continue and roughly 3-6” per 24-hour period to fall through Sat. Thursday during the day should do a little better than that. The big news for across the state is Southern Utah will get hit with a strong low-pressure system. Precipitation will begin Wed morning for the southwest mountains and later in the day for the south-central and south-eastern mountains. Totals for Brian Head look very impressive, with 20-28” expected by that time (maybe more if everything comes together). Central and eastern areas should see 1-2”. Extended Period: Some weather prediction models have a storm skirting to our north late Sat through Mon with decent snowfall for northern UT. However, there is a decent amount of uncertainty right now with this system so check back soon to see how strong we think it will be and if it is still on track to skirt or hit northern UT. See below for some of the possibilities. It has been a good week for the mountains for sure. There were a few smaller storms and a few bigger ones, and the holiday weekend has seen mostly fair weather with some showers adding a few inches to the total. 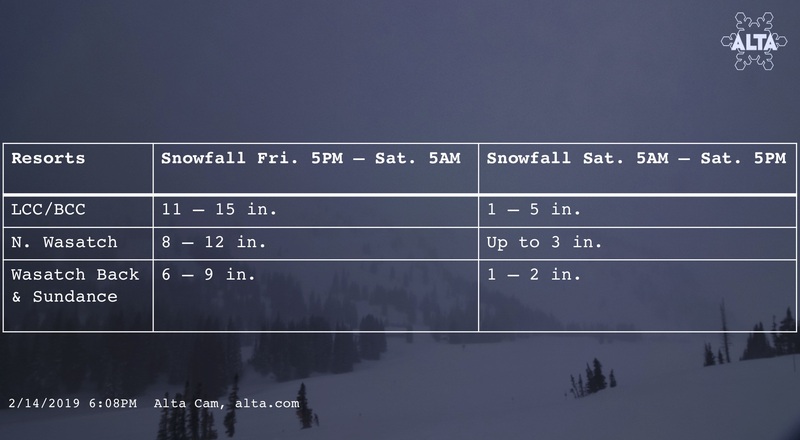 Alta-Collins has made it up to whopping 134″ of depth. That’s 11 feet and 2 inches or 3.4 meters. This is a representation of the waves in the atmosphere halfway up (and green shading for humidity). Notice that Utah is right in the middle of a large and deep trough. The winds are weak and the jet stream is well to our south. Troughs can be like ridges in that they can be a bit stagnant. However, they are significantly better than ridges for winter enthusiast for a few reasons. First is that we’re north of the jet stream and it’s cold. Second is that there’s a lot more (relative) humidity around. Third is that cold air above 40°N land in late February can be a recipe for popcorn showers. These ingredients together mean that I think it’s going to be a good week. It’ll give the snowpack a chance to settle, and the clouds will keep that late February sun at bay (it’s as strong today as it is October 24th). Plus we’ll have weak showers that keep thing fresh all week long. Below is an ensemble forecast for the Cottonwoods, and it shows how we’ll get an inch or two several times this week just from pop-up showers and weak disturbances (the CMC members in this case is out to lunch and should be ignored). One of the troughs we’re under is one of the really slow ones, so it’ll be a while until we’re back into a super stormy pattern. But I’ll take this over a ridge any day. There’s no secret about it–western US resorts continue to be the recipients of a barrage of heavy (and just a little breezy…) snowfall events. Tonight’s forecast is a case in point. In short, the snowfall forecast for the upcoming storm has been pretty consistent. I’d recommend you read yesterday’s discussion about some of the storm details. As you can see, the bulk of the storm’s impact will occur overnight before the blackout crowds emerge up the canyons. According to SREF (probabilistic forecast), the most substantial precipitation rates should occur between about 7 PM on Friday and 12 AM Saturday. During this time, many resorts could see an inch per hour, perhaps locally higher rates. Note that the difference between this storm and other storms this week is temperature; Wednesday and Thursday were warm, and temperatures tonight dip relatively cold at all elevations. For example, as I’m writing this (~3 PM Friday) temps at Alta are close to a balmy 28 degrees F.
By comparison, the NWS forecasts at Alta project 25 degrees just before the front passes around 6 PM, followed by 14 F by midnight, 11 F by sunrise, then a Saturday high of 19 F. To no surprise, snowfall is effectively greater for every unit of snow-water equivalence when temperatures stay substantially below the freezing point. In other words, more bang (light, fluffy powder) for your buck. Fortunately, winds are tamer during this storm compared to the early-week storm. If you’d be hanging out on some peak in the central Wasatch overnight, you might experience 25-35 mph winds. However, these die down to between 10 and 15 mph by sunrise Saturday. Naturally, wind speeds at lower elevations will be milder for Saturday skiers. As Tyler alluded to yesterday, the local weather should relax by Saturday evening. However, we aren’t looking at another ridge set-up to break the pattern. Instead, we’ll be open to light snow showers beyond Saturday underneath an upper-level trough and the amplified polar jet. As a result, and over the next week, the interior west can expect relatively cold temperatures and some opportunities for quick-hitting storms. At this point, forecasts deem potential mid-week storms as nothing major. Obviously, that can change as we turn the weekend corner. Stay tuned. TLDR: More snow tonight (see totals below) with snow levels around 7500 ft but lowering. A small break on Fri with a strong cold front and mountain/valley snow Fri evening, bringing another 8-12″ by Sat morning and snow showers through Sun morning. Read on for details. We’ve been in warm, wet southwest flow over northern Utah today. 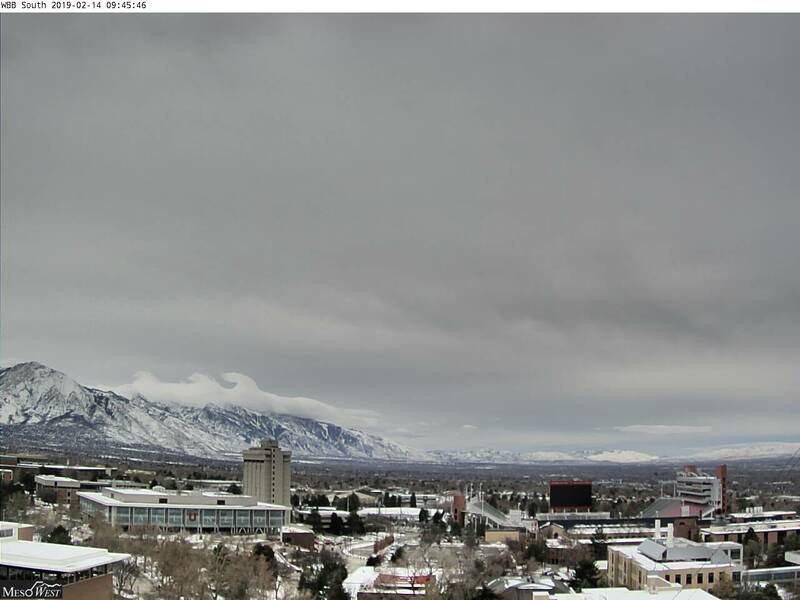 For some visual proof, check out the orographic (mountain induced) clouds that formed due to air rising up the southwest side of the Lone Peak area. As an added bonus, we even got some breaking mountain waves (likely “Kelvin-Helmholtz” waves due to the presence of wind shear) over Lone Peak this morning. Looking south Thu morning from University of Utah.